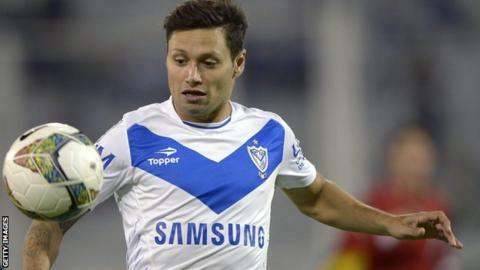 West Ham have signed Argentine forward Mauro Zarate on a three-year contract from Velez Sarsfield. The 27-year-old will join with a further one-year option when the international transfer window opens next month. The former Lazio forward scored four goals while on loan for Birmingham in the Premier League in 2008. He said: "I hope I will bring goals to the squad. I will also bring dribbling skills and other attacking qualities." Zarate was top scorer in Argentina last season with 20 goals in 35 matches in all competitions. However, this second stint at Velez Sarsfield followed a controversial four-year spell at Lazio. In 2010, while serving a two-match suspension at the Biancocelesti for insulting a referee, he was photographed giving a fascist salute amid the 'Ultras' section of fans. Zarate's spokesperson later claimed the player was unaware of the significance of his actions. In April last year, Zarate was spotted on holiday in the Maldives when he was supposed to be in Argentina receiving medical treatment. At the time, he was not training with Lazio's first team because of disciplinary issues.